More posts at Cooperative Catalyst where Paula White is tracking this a bit better than I.
Adam Burk: "Education for Sane Planetary Citizenship"
Becky Fisher: "Effective at What? Effective for Whom?" Mary Beth Hertz: "Take the Power Back: Teacher-Run Schools"
Paula White: "Planting… or Uncovering… Brilliance"
Ira David Socol: "Changing the Structure"
Ira David Socol: "The Third Technology"
Teacher Ken: "One educational reform I would like to see"
Dan McGuire: "e-portfolios will be central to the new form"
David Britten: "Real Reform Begins with Raising Expectations"
David Britten: "The Rule of Law"
Pam Moran: "Imagine. November 22, 2010"
Jon Becker: "To everything there is a season... except learning"
Chris Lehmann: "What we can do: New Teachers"
Dan Callahan: "What #edcamp has to teach us about PD: A letter to administrators"
Miss Shuganah: "Don't Be Stingy or, Forming a Grassroots Organization to Save Public Education"
Stephen Hurley: "Re-Inventing The Learning Process: Really?" Larry Ferlazzo: "The best lists on School Reform"
Deven Black: "All This Talk of Reform is Making Me Cranky"
David Wees: "Reform Through Action"
John T. Spencer: "A humble reform"
Greta Sandler: "America needs Reflective Educators"
Shelly Terrell: "Education needs Reflective Educators"
Michael Kaechele: "Real Reform Goes Backwards"
Ann Etchison: "Golf, Procedural Knowledge, and Ed Reform"
Mike Lubelfeld: "Educational Reform - changing the way(s) in which we always do things in public schools..."
Corrie H. Kelly: "“Drowning in shallow water”: How can we deepen literacy instruction?" 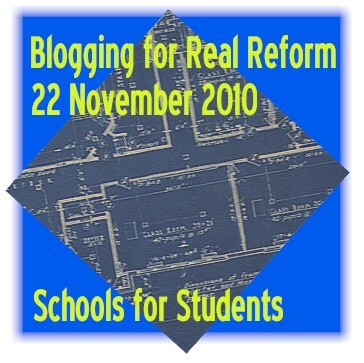 Kevin Hodgson: "Blogging for Real Education Reform: Empower Students"
Dave Meister: "Positive Reform, making it happen"
Jason Flom: "My Inner Pollyanna’s Ed Reform Blue Sky"
EdReformPR: "Zombies are attacking! Ready the children!" Bill Bushaw: "National Day of Blogging for Real Education Reform: PDK’s Commitment"
David Warlick: "Education Reform is Re-establishing, Redefining and Retooling"
Tony Baker: "Technology Training for Teachers - The Right Way"
Alice Mercer: "Blogging for Reform: First, let’s fire all the teachers…"
Michael Thornton: "Go beyond the Four Walls of the Classroom"
Jonathan Martin: "Computer-based Math: the silver bullet for Math education"
Steven W. Anderson: "#Blog4Reform-Slow Down And Take A Step Back..."
Jeremy Lenzi: "How can (I, you, we) work toward ed reform?" Heidi Hass Gable: "Mixed Messages"
Eric Sheninger: "Passion Drives Us"
Ryan Woods: "Educational Dilemma - What's Important?" Sabrina: "Whatever happened to promoting student ownership & responsibility?" Chad Ratliff: "Are We Preparing Developers or Producers?" Peter Pappas: "9 Questions for Reflective School Reform Leaders"
Kyle Pace: "The Passion Bug Is Spreading. Have You Ever Caught It?" Lyn Hilt: "Win the Battle"
Lyn Hilt: "Loosen up (your hold on classroom management)"
Walter McKenzie: "From Drift to Shift: Celebrating the Transformation of Education"
EdVoices: "Celebrate the National Day of Blogging for Real Education Reform on November 22"
Stephanie: "Ed Reform – Critical Time To Truly Make Change Happen"
Jeff Delp: "Unfettered Educational Reform"
Chris Fancher: "National Day of Blogging for Real Education Reform"
Chris Fancher: "God Bless Elementary School Teachers"
Gail Poulin: "Sharing Ideas in Teaching"
Mrs. Brophy: "Those that inspire…teach"
Tobe Buffenbarger: "$120,000 for 20 Years of Service?" Lani Hall: "An appreciative vision"
Ruth Bettelheim: "Time for Schools to Stop Damaging Children"
Bob Sprankle: "Overlooking the Obvious"
Bill Ivey: "So Close and yet So Far"
Bill Ferriter: "Testing is Destroying Schools"
David Truss: "Passion Driven Conversations"
David Truss: "Thinking about Change"
Vanessa Peters: "Preventing Reading Learning Disabilities"
Jeff Jarvis: "Who says our way is the right way?" Chris Fritz: "The WHY, WHAT, and HOW of Real Education Reformation"
Rick Hess: "Even on IDEA's 35th, Special Ed Dollars Aren't Free"
Mrs. Ripp: "A Teaching Degree Does Not Make a Teacher"
Deanna Senn: "Research + Classroom Application = Real Ed Reform"
LeeAnn: "The Power of Integrated Curriculum"
Doug Peterson: "Blogging for Real Reform"
David Loitz: "It is about relationships, stupid"
David Loitz: "Transformation Plan: Designing Backwards"
Walt Sutterlin: "A Mission from the Heart"
Institute for Humane Education: "The World Becomes What You Teach: Transforming Our Education Systems to Graduate Solutionaries for a Better World"
Nicole: "How I would change education"
Mr. Zimmer: "America's next best teacher"
Kathy: "Education for Profit and Its Nexus with the DPVA Decision"
Michael Sweeney: "Should we be good at school?" Kristin: "Should we be good at school?" Rafaela Ramirez: "Do I have to good at school in order to be successful?" Amanda Brooks: "Should we be good at school?" Ashley Alexander: "Should we be good at school?" Nick2.0: "Should we be good at school?" Jason Tarpey: "Should we be good at school?" Shelley Owen: "My Rants and Praises"
Carolyn Foote: "21st Century Education is the Real reform"
Bonitadee: "What is our Purpose?" Mike Klonsky: "The trend for appointing CEOs to top ed jobs"
Julie Woestehoff: "National Education Blogging Day"
Julie Woestehoff: "School Funding and the Kindness of Strangers"
The Frustrated Teacher: "KIPP Should Change Its Name To CIPP: Updated"
Dana Bennis: "Ten elements of a good education"
Robert Skeels: "Governor Elect Brown: Please remove Ben Austin from the State Board of Education"
Cian Sawyer: "And I'm not saying there's only one way..."
Richard Lakin: "44 Words which Bear Repeating"
Adrianne Stone: "The “New Normal” of Sec. Duncan"
Ann Leaness: "We Stand Beside Them and Learn"
Garden337: "A moment for education"
Eric Juli: "Name your reform"
Mary Rice-Boothe: "One size does not fit all"
Lauralee Moss: "Normalcy of Public Schools"
Pam Lowe: "Keeping what's important in focus"
Chris Liebig: "What is "content"?" Kelly Tenkely: "Education doesn’t need any more Nip Tuck: Our Normal Approach is Useless Here"
Frank Noschese: "Science for 21st Century Students"
Milton Ramirez: "US National Day of Blogging for Real Education Reform"
Renee Moore: "Taking charge of our profession (again)"
Yoon Lim: "Learning for pleasure, seriously"
Stella Porto: "Blogging for Real Education Reform"
David Andrade: "Incompetent Teachers or Dysfunctional Systems? Fix the system to support the teachers." David Andrade: "Excellent Education Model - WPI's Plan"
ZebBassoon: "There Is NO "Magic Bullet"; "Superman" Does Not Exist"
J. Robinson: "Is It Reform or Is It Memorex? Nature of True Education Reform"
Charlie Sutherland: "Schools a third way"
Zoe Branigan-Pipe: "Teaching Teachers to become Global Educators – an inquiry approach"
Paula Naugle: "Transform to Reform"
Tyler Rice: "What I want from my union"
Tyler Rice: "Reform Education - one classroom at a time"
Donna Mace: "Even in failure the St. Johns County public school system got it right"
Shullamuth: "Re Form: Why Libraries are the Future of School." Jennifer Sertl: "Fostering Passion and Curiosity"
Shelley Krause: "Mind the Gap"
Sarah Puglisi: "Yeah, Maybe It's ALL about Finland"
David B. Cohen: "Education Reform Tragedy, and Catharsis"
Casey Corona: "The Collective Individual"
Adam Fletcher: "A New Vision for Students in School Reform"
Chad Sansing: "Gowalla and the virtual geography of learning"
Eric Brunsell: "On Education Reform - Equity"
Carrie Bakken: "Minnesota teacher to Secretary Duncan: To improve teaching, put teachers in charge"
Ted Kolderie and Joe Graba: "Describing teacher-run schools in a Teacher Magazine interview"
Nicole Pelton: "Obsessing over education"
Tamar Wyschograd: "One parent's story of one school"
Shelley Wright: "Taking the plunge"
Marla McLean Atelierista: "An Awakening of Sorts"
Ryan J. Wassink: "Ryan's Recipe 4 Reform"
Anne O'Brien: "Reform Education: Get Rid of the “Students as Widgets” Mentality"
Scott McLeod: "If we were really serious about educational technology"
"Arne Duncan" [ED.gov]: "Making Real Progress on School Reform"
And we are thrilled to have enabled this wide-ranging, fully open, conversation. Fantastic List. Superb job. Great turnout. Well done, getting linked from Arne Duncan's blog post! Thank you for the excellent compilation of posts. Sara J. Schmidt's 10 Keys to Real Education Reform"
Dr. Kristan Morrison's "My Vision for a Transformed Education"
It's exciting how many folks came together from around the country to share concrete, positive ideas for real reform. What Postman & Weingartner said about Ed Reform over 40 years ago still applies today. My post simply reviews some of their thoughts from Teaching as a Subversive Activity.